This is a very late post and I'm sure all of you already know that Bianca Gonzalez launched her first ever book, Paano Ba 'To? !, last November 2014. I've been a fan of Bianca since her Game Channel Days. I've always admired her for being real, talented, intelligent and versatile. And because she writes from the heart, it's no wonder that this book is selling like hotcakes since its release. I was lucky to be invited to Bianca's book launch/signing at NBS Trinoma. Paano Ba To?! is every girl's guide to growing up. 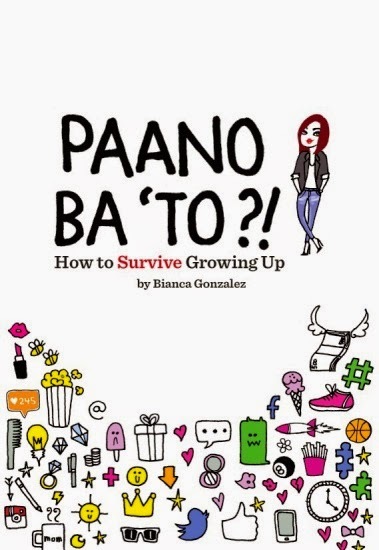 In this book, Bianca shares her experiences, thoughts and advices on how to survive in this, as she called it, crazy, wonderful world. I know there are a lot of self-help books in the market already, but what made me love Paano Ba To?! is the way Bianca wrote it. 'Yung connection niya sa readers nya, ibang klase. It's like taking advice from your older sister--a very cool and fun Ate. The book has chapters about Family, Friendship, Love, Career & Money, Failures, Fashion & Beauty, Purpose and of course, Self. I'm still halfway through the book, but I already learned a lot from it. Ilang beses na ko napa-"Tama eh! Sakto to!" habang binabasa itong book na 'to. Bianca is right, she might not know all the answers to every situation, but still, it helps to know that you're not the only one who's struggling to live in this world. How do I deal with pressure from my parents? Sobra na mag-selfie ang kaibigan ko, paano ko siya sasabihan? Wala pa rin akong boyfriend. Should I worry? Magkano ba talaga dapat ang savings ko? How will I figure out my "purpose" in life? Paano ba maging mas confident? If you find yourself asking the same questions above, then you should definitely get this book. I wish I had this book when I was younger. It would've helped me choose the right course back in college. Haha Kids nowadays are lucky because they have Paano Ba 'To?! to guide them as they grow (not go) through life. Aside from Bianca's advice, the book also contains stories from celebrities and TV personalities like Toni Gonzaga, Anne Curtis, Luis Manzano, Ramon Bautista, Tim Yap, Marian Rivera, Atom Araullo, and more. The book retails at PHP 245 in selected National Book Store and Powerbooks Store branches nationwide. hello, happy 2015 and great post. I do not see follower, you can review?